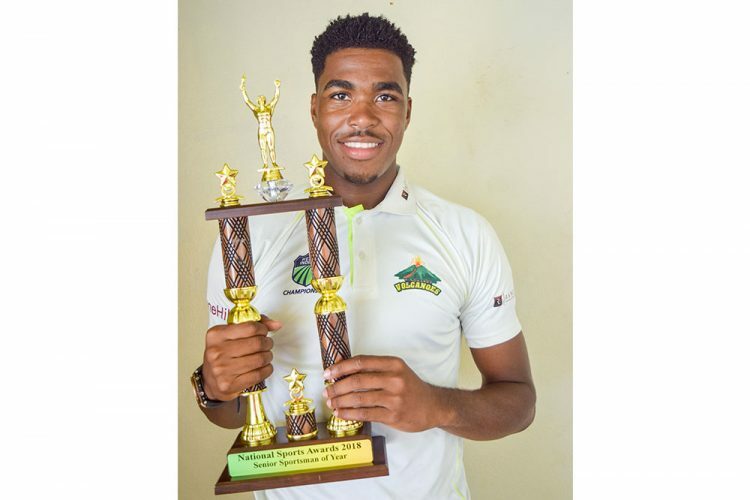 When left-arm fast bowler Obed Mc Coy was announced at the 2018 Senior Sportsman of the Year at the National Lotteries Authority National Sports Awards, last Saturday night, at the SVG Community College’s auditorium, it extended cricket’s reign on the accolade. Mc Coy thus followed the path of other cricketers – Delorn Johnson, Sunil Ambris, Kesrick Williams and Ambris, in that order, who have been named successively as Senior Sportsman of the Year. During the year in review, Mc Coy returned some creditable performances. He was the West Indies B’s leading wicket-taker, claiming 11 wickets in the Global 20/20 in Canada in June/July. In the Caribbean Premier League, from his seven matches for St Lucia Stars, ended as their joint-highest wicket-taker. His nine wickets came at 7.80 runs apiece. These performances earned Mc Coy a call up for the senior West Indies team. Mc Coy made his West Indies debut in the ODI format against India in India, in October.